GIGASENSE® is a fail-safe anti-collision system / collision avoidance system for track bound cranes (EOT) or similar equipment in tough industrial environment. 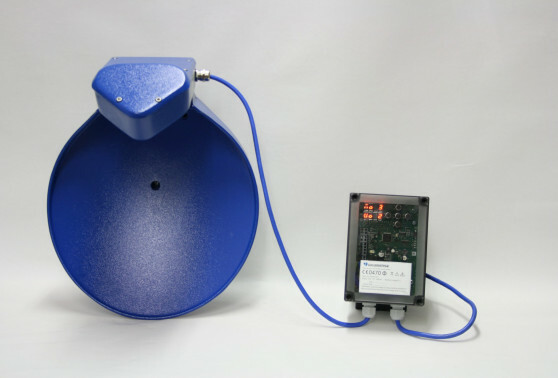 The GIGASENSE anti-collision system is easy to install, robust, maintenance free and comes with built in self diagnostic functions to monitor the system. The microwave technology makes it especially suitable for steel-works, harbors and the like environments. To protect two cranes: one crane uses an A-unit and one crane uses a B-unit. A- and B-units each consists of an active antenna and a relay box. The antenna sends a Microwave signal to the opposite unit. By using SFCW (Stepped Frequency Continuous Wave) radar, the distance and relative speed are calculated. To protect a crane from a wall or a track end: one transponder without the relay box can be used together with a complete A- or B- unit on the crane. The output relays switches at preset alarm limits to reduce speed and stop the crane movement. Settings and readout of parameters are easily accessible via a display and push buttons in the relay box. Relay 1 = Warning (speed reduction) or flashing light. Relay 3 = Failure/unidentified object alarm. One analogue output, 4-20mA is available for e.g. remote display. Avoids crane accidents and protects property and production. Designed to work in the toughest conditions such as in Steel works, Harbours, Mines etc. Fail Safe operation due to supervision of function, both in antenna box and relay box. The signal is very hard to disturb, the A- and Bunits use different frequencies, different polarization of the Microwaves and a ”fingerprint” radar reflection. The function has a backup capacitor in case of power failure. The anti collision system is not disturbed by rain, dust/metal particles, fog or sunlight. Between 2-20 and 2-50 m (varies due to country limitations). 0.05 – 10 m/s relative speed between two moving cranes. The alarm limits can be compensated 0-200 % for different speeds..
Three potential free relays (250 VAC / 8A)..
24 VDC (alternative Voltages available as option). Transponder unit 12 VDC. 9.4 – 10.6 GHz (country specific).